First job was to fix a few issues with a friends bike. He just got himself a nice new one and wanted to give his old one a spruce up. This bike has done the London to Brighton run 5 times I think. Its also done London to Southampton once. It was also the go to the shops bike. So its done a few miles. Some of the wear was not unexpected. The chain rings were scrap! 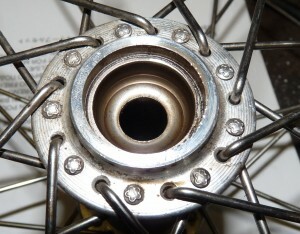 What came as a shock was the front wheel. While fitting new brake blocks I though I’d simply not tightened the front wheel up enough. On closer inspection one of the bearing cones was a good 6-8mm further into the hub than the other. Ah crap, time to take it apart. Oh dear, this can’t be good! I’m not sure it had all the balls left in the bearing either. The bad side! Where did the bearing cup go? Right, new front wheel as this is scrap too! 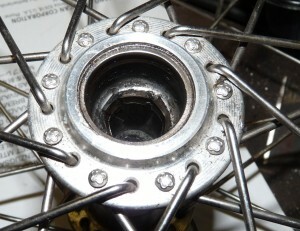 What worries me is who tightened up the bearing to such an extent? I know it wasn’t me! So got the bike running smoothly and changing gears with ease. Next job… a ride on mower! Owner didn’t think much was wrong but it was making a hot rubbery smell. After some surgery I managed to get the main drive tensioner off….. 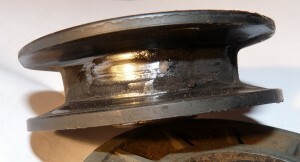 The belt was busy wearing away the plastic of the pulley and itself. Not long and that would have snapped. 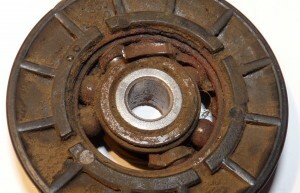 It had worn down to the outer race of the bearing and had actually started to wear away the metal. Ended up changing 2 pulleys, 5 bearings and 3 belts. The mower is much quieter now. Amazing! I also gave it a full fluid service. I don’t think the transmission oil had ever been changed. It looked awful and smelt worse.